THE LOWER LIMBS have been enlarged since childhood. 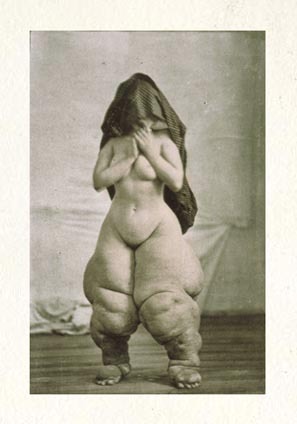 Patient had Scarlatina at eight years of age, which was followed by general oedema. From about that time the limbs have been increasing in size. Has been subject to attacks of chills followed by high fever, lasting three or four days. These have occurred at intervals of three or four months and have been followed by a marked increase in the size of the limbs. On the anterior aspect of the legs there are now (Dec. '78) several patches of thickened and roughened epidermis. On the posterior surface of the right leg ulceration began about eighteen months ago. Sloughing occurred about a month ago, and there is now an excavation four inches in diameter and four and a half inches in depth. There are one or two patches of superficial ulceration, oozing a large quantity of clear serous fluid. Since this oozing began the legs have diminished in circumference. The general health is failing. hers has been more breakered and stinging. and foam to nothing? Think on her this day. not a young girl who dreamed no more of dancing. to make a veil, to veil him out and blind the event. all smelling of cedar, of myrrh and covenants? and diminishments, excavations and the final failings. But do not turn away from her. slowly as a lifetime, into your arms.